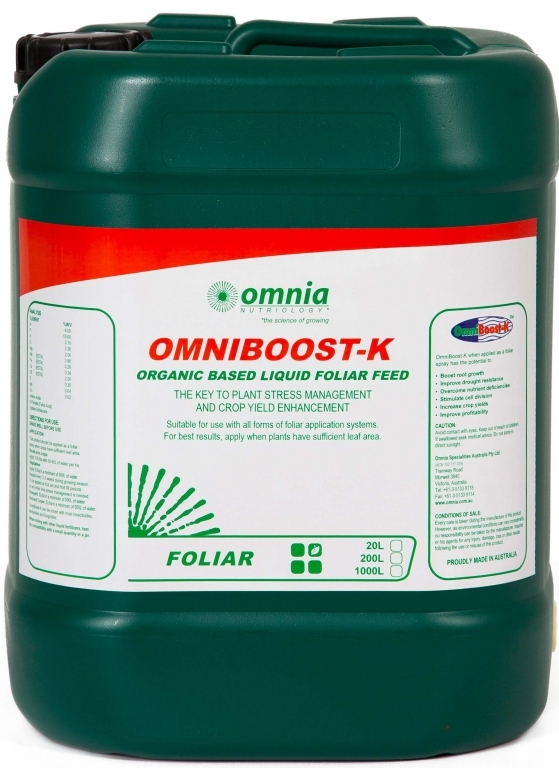 OmniBoost-K is an organic based, foliar feed that ensures optimum crop production. Specially formulated with fulvic acid and amino acids for harsh Australian conditions OmniBoost-K is an essential component to relieve stress and boost the anti-oxidant system of the plant. OmniBoost-K rids the plant of toxins built up during periods of stress, repairs chlorophyll and restimulates the plant. This product should be applied as a foliar spray when crops have sufficient leaf area. Apply 3-5L/ha with 50-60L of water per ha. Apply 5L/ha in a minimum of 500L of water. Repeat every 2-3 weeks during growing season. To be applied at fruit set and fruit fill periods or any other time stress management is needed. 5L/ha in a minimum of 500L of water. OmniBoost-K can be mixed with most insecticides, herbicides and fungicides.